Were They Bean Bags at Maitai Global's Perth Event? Bean Bags R Us NewsDesigner Bean BagsDid you see our Bean Bags at Maitai Global’s Perth Event? Did you see our Bean Bags at Maitai Global’s Perth Event? Where do technology masterminds, entrepreneurs, athletes, venture capitalists and start-up founders go to network and have fun? If they’re on the A-list, you can find them at exciting events where they’ll be showing off their kiteboarding skills or chatting with their peers. And many of these high-level execs will be seated in the comfort of one of our bean bags. Founded by Silicon Valley investor Bill Tai and professional kite surfer Susi Mai, the MaiTai Global Kite Camp began as a small gathering of friends and kiteboarding enthusiasts. The group first met at the vacation home of Yahoo’s chief financial officer, Ken Goldman. The kite camp has now grown into a five-day, invitation-only event held in various locations around the world including Perth, Australia, where an event took place in February 2014. A combination of a business conference, a kiting convention, and a networking event, the kite camp allows participants to form lasting friendships in a relaxed atmosphere. Here attendees may contribute their talents and energy to a shared experience that centres around philanthropic efforts and kiting prowess. Kiteboarding or kitesurfing is a relatively straightforward, high-adrenaline sport that requires a surplus of energy and confidence. These exciting factors make it perfect for the driven entrepreneurial personalities who enjoy the kiting events and often compare their determination to excel at the sport to their business philosophy. Kiteboarding is similar to wakeboarding; one only needs a large kite, board and a 75-foot tether to connect the two. The wind does the rest. The sport requires concentration, focus and physical coordination; it’s not for your average beach bum. February’s Perth kiting event saw many Silicon Valley residents and other top names in technology come to enjoy the natural beauty. During the event, participants share innovative ideas and learn from each other’s successes and failures in all life’s endeavours as they mastered the complex skills needed for kiteboarding. Organizer Bill Tai claims that when he was first invited to speak in Perth, the idea of kite surfing and the legendary excellence of the windsurfing and kiteboarding communities in Perth and Margaret River impressed him. The flight to Australia is time-consuming. But because Californian innovators and entrepreneurs have the type of personalities that are drawn to adrenaline sports like kiteboarding, it was well worth Tai’s effort to make the trip Down Under. It was a first visit to the country for Othman Laraki, a co-founder of Mixer Labs, Inc. and a powerful force behind the growth of Twitter. Although he had longed to visit Australia while helping to develop and grow Twitter, the opportunity to enjoy kite surfing ultimately drove his decision to attend the Perth event. Other attendees included entrepreneurs from some of the world’s largest technology brands such as Google, Apple, and Facebook. The meeting of so many creative forces inevitably leads to progress. More than 20 start-ups have launched at the famous kite camp. Those aren’t the only great results; the non-profit organization actively supports a number of admirable causes. Their interests include preserving and protecting the ocean, marine wildlife, and the world’s ecosystems. We are proud and excited to sponsor the MaiTai Kite Camp at Perth in February 2014. Our Big Mama Straps were a perfect fit for the event. 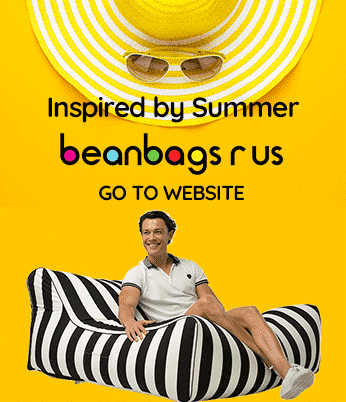 The outdoor beanbags feature adjustable straps, so users can easily use them as chairs, sun loungers or couches as well as giant pillows for kids, adults and everyone in the family. Their large size makes them ideal for promotional use; we can screen print a company logo or image directly onto the product to produce highly visible, colourful branding that’s impossible to ignore. Our line of unique bean bag chairs, loungers and floats offer something for every indoor and outdoor corporate environment from indoor seminars to outdoor conventions. Whether you’re planning a kitesurfing event, a golf tournament or a ballroom bash, contact us today and let us help you add excitement, comfort and style to your company’s next big event.